The talks held with the EU official focused on the preparations for Romania’s takeover of Presidency of the Council of the European Union as of January 1, 2019, as well as on the priorities that our country has for this mandate on security and defence matters. The two officials also discussed subjects currently on the European security and defence agenda, focusing on the ongoing initiatives. Thus, the Minister of Defence expressed Romania’s support for the strengthening of the EU profile in the field of security and defence, with regards to the complementarity of the two organisations, as well as EU’s active synergy with NATO. In this context, Gabriel Leş highlighted the importance for Romania of the Common Foreign and Security Policy / Common Security and Defence Policy (CFSP / CSDP) and its inclusion amongst the central themes of the mandate of the forthcoming Presidency of Romania at the EU Council. Also, the two officials’ talks addressed issues related to European defence initiatives such as PESCO, EDF, CARD, EU-NATO cooperation, ongoing operations and missions under the CSDP. 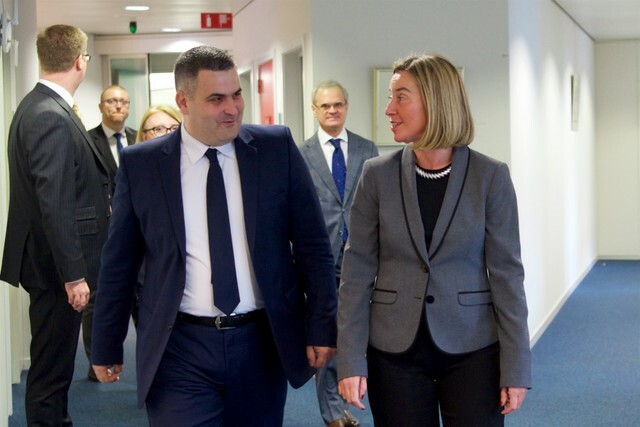 The meeting with Federica Mogherini was a good opportunity to reiterate our country’s support and interest in strengthening the CSDP dimension of the European Union, as well as highlighting Romania’s commitment to ensuring a successful Presidency at the EU Council.